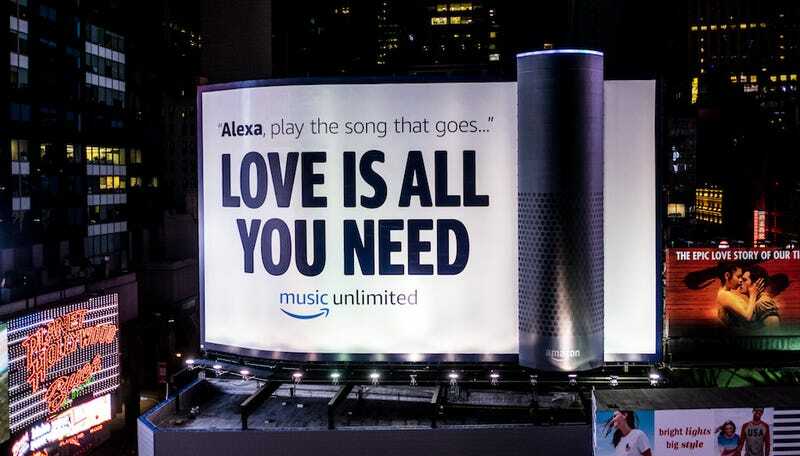 Amazon announced today that it had erected the “largest Times Square advertising installment ever,” which is actually a 79-foot-tall Echo replica. While it can’t listen to commands like the real thing, it does have fancy LED lights that mimic the ones that light up when you ask the actual gadget what the weather is today—or whatever it is people ask these things. Standing over seven stories high, with a circumference of around 24 feet and weighing over seven tons, the giant aluminum Echo replica will be on display on Broadway between 44th and 45th Street now through June 25. Yet to my surprise, several other colleagues disputed my characterization. One claimed it looked like a giant e-cigarette; another argued that, while she thinks a lot of things look like dicks, this didn’t quite hit the spot for her.